So now you’ve written a great log line for your script, crafted a professional query letter pitching your screenplay, built a database of agents, managers, and producers, and started to send your query letter to those contacts. And hopefully you’ve started to get some requests for your screenplay, too! After you submit your query letter you’re going to find in most cases nothing happens. Literally nothing. The vast majority of the companies will not reply one way or another. You’re also going to find some companies will reply that they did receive your query letter but that no one at the company read it because they do not accept unsolicited material for legal reasons or because of company policies. This may be company policy or it might be a polite way of passing on your material. I’ve found that I can sometimes get material submitted (without an agent, manager, or attorney) to these sorts of companies if I hit the right person with the right pitch at the right time. I had a friend get his query letter to an agent at CAA, once, so anything is possible. I’ve written two blog posts on this subject here and here. In general, I feel like it’s worth the effort to submit to these companies. This rejection is normal. It’s part of the process. Don’t worry about it. The key is to keep submitting. If you have a well written query letter and you submit it enough times, you will find that every once in awhile someone will request to read your full screenplay. On the surface what you’re hoping to accomplish with these cold query letters is an option (click here to learn more about screenplay options) or sale of your screenplay. However, that’s not the only thing you should be working towards. You should also be working to build relationships with industry professionals. In some cases the companies will get back to you with a polite “no thanks.” I always reply to these emails thanking them for reading my material, thanking them for getting back to me (most companies won’t get back to you at all), and then asking them what sort of material they’re looking for. In most cases they’ll tell you what they’re looking for. This is valuable information as you try and decide what spec script you’re going to write next. Or you might have something else already written that you can immediately pitch to them. But even more importantly you now have a real contact that you can submit to in the future. When I’ve written a new spec screenplay I usually like to send it out to all the people that I have some sort of relationship with first. These polite, professional back and forth emails will start to build those sorts of relationships. Keep all these back and forth emails in a separate folder in your email account called something like “script-contacts” and then when you’re finished with another spec script go through them and see which ones you want to submit to. This query letter will be more personalized, you’ll reference your other script, and hopefully they’ll remember you. I actually have two folders in my email account for these sorts of contacts. One for “script-contacts” and one for “strong-script-contacts.” When a person or company has been very positive about my writing or they’re someone who I’ve actually met or talked with on the phone and I think they’ll probably remember me, I usually put them in the “strong-script-contacts” bin. Often times after a few submissions I can elevate someone from the lower bin to the top bin after I’ve built up a rapport with them. It doesn’t matter how you do it, but you should most definitely try and keep these responses organized and use them in the future as you complete new projects. Getting these sorts of contacts to read your new material is much easier than sending out cold query letters. One of the other possible outcomes from these submissions is that a producer will hire you to write an idea that they have. If they like your writing but the script isn’t quite right for them, it’s possible they will have another project that they might hire you to write or re-write. It might not be something that happens immediately, it might take submitting a few screenplays to the same producer, but if you stay in contact with people who have been positive about your writing these sorts of things can happen. Again, it’s all about building relationships. 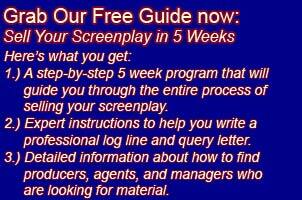 Once you receive a few script requests I recommend following up with them in about 6 weeks via email. Always be polite and professional. The sad reality is that in most cases you won’t hear anything back after you’ve submitted your screenplay. I’ve written a couple of posts here and here which go into this in more detail. One myth I would like to dispel is that you need an agent to sell your screenplay. You don’t. While I have had agents and managers during some of my sales and options, every single option and sale I’ve had has been a direct result of me marketing my screenplays. The agents and managers I’ve had only served to help negotiate the deals, which while helpful, wasn’t a mandatory part of the equation. Producers are looking for good material, and ultimately they’re not going to care if you have representation or not if they like your screenplay. If you want to try and find an agent or manager, fine, but don’t think that once you have an agent or manager it’s all going to be smooth sailing and you’re going to be working full time as a screenwriter (another myth) because the chances are that’s not what’s going to happen. You’re still going to have to get out there and market your material, even if you are lucky enough to find an agent or manager to represent you. I wrote a post about finding an agent that might be helpful: How do you get an agent for your screenplay? (And why you don’t need one! ).